Optin forms are a huge buzz over the internet. Almost every business wants to grow their list and wishes to stay connected with their audiences for long. Icegram realized this and we wrote a blog on ‘How to embed Optin forms into Icegram’ sometime last month. We tried making it easy for our users but found out there were certain issues with the Css formatting. This made the layout of the form look ugly. Also the whole process was very tedious.We felt our customers deserved something quicker and simpler and this made us come up with the following solution. 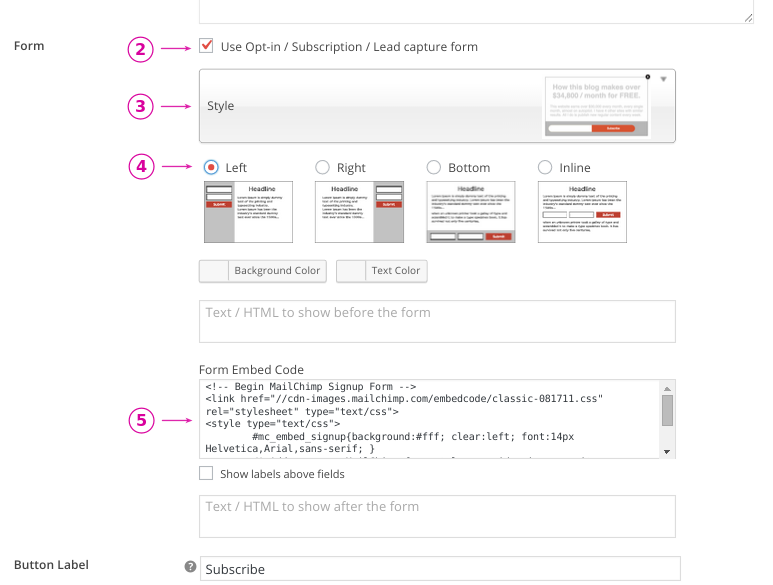 Now, integrating the layout from any subscription form is a matter of few clicks. Almost all of the message types of Icegram are fully compatible to form integration except badges, ribbons and notifications. Incase you face any problems, either email us or simply drop us a comment right here! From the screenshot provided we assume you are using the ‘Hello’ theme of the action bar. Here’s a quick workaround of something you wanted to achieve. All you need to do is add inline CSS for form in the message body (WP message editor) and tweak it as per your need. So firstly, I added the embed code from MailChimp but now the background colour setting on Icegram is being ignored. How do I fix that? Also, I tried adding your inline script, and it did nothing. Any thoughts? Thanks! Please send your MailChimp form embed code to hello@icegram.com – we will take a look. Also, which inline script are you adding? Hi, How change the color of the subsribe button on the theme popup? The button color is determined automatically based on the background / text color and theme. If you don’t like it, you can leave the “call to action text” blank (which hides the button), and add your own button in the message body itself with a CSS class “ig_cta”. Hi, if i add form than there apears a scrolling bar. Can i remove the scrollingbar? What message type are you using? Most messages should automatically expand to accommodate your content – including the form. If the form is long, you may try to shorten it. Or layout the fields horizontally. You may also need to check your theme CSS to see if it’s adding a lot of margin / padding. Do try these. If you still have problems, contact our suppor team. Just wanted to pass this little bit of information on. I was using a shortcode inside a locked popup optin. I was having a problem breaking the lock. My CRM/autoresponder (LeadOutome) requires a redirect; and it was redirecting to a new window leaving the old window intact along with the locked popup. I needed a way to engage the popup’s button. Another thread here spoke of a way to do that with an image using class = “ig_cta”. I accomplished it by putting the shortcode into a div with a class parameter. Alignment doesn’t work properly with gravity forms. It must be great if you can fix it. We need to get it tested! So kindly send us the html code you’ve been integrating with, directly to our support team at hello@icegram.com. The code you have been inserting wouldn’t work with the Icegram messages type. Icegram is compatible with HTML code for the form. And with the latest version 1.9, you can also add a shortcode in the form. However, we would like to help you further. So incase you have anyother questions kindly reach out to our support at hello@icegram.com. Thanks! Right now I only get the Mailchimp follow up. Our support will like to look into this issue further. Kindly contact them at hello@icegram.com. The issue will be taken care from there. I am embeding a constant contact form and when I add an email address and hit join it sends me to a white page that says success instead of sending me to the success page. Please inform why this is doing that and how do I fix it. If you have a form in message body it will simply submit and stays on success page. But if, success page is different from success page of contact form, Please send your link where you have embed code to hello@icegram.com – we will take a look. Has there been any update on this issue? I’m having the same problem. When you have Icegram message with form, on a click of button it will submit the form (no redirection to the page). If you want both submission and redirection, you can use CTA Actions addon. If you still have queries, please contact us at hello@icegram.com . By looking at the code, it seems incomplete. There is no HTML in code (only CSS and comment). It will not display anything. Please paste complete HTML code and check. If you are still facing issues, Please Contact Us with complete HTML code of your form. Hi There. I am trying to implement a Sendinblue form that is in HTML, in the HTML box, but the form does not show up. I only get two input boxes and a submit button. How can I fix this? Can you please give us the link where you have setup Icegram message(Sendinblue + Icegram)? It will be helpful if you can write us mail “hello@icegram.com”.We will look into it.